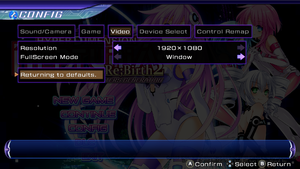 Offers some improvements over Re;Birth 1, including native borderless windowed mode, fix for analog sticks axial direction lock and fixed issues with cutscenes. 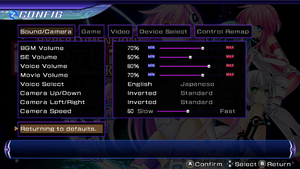 Many fixes available for the Re;Birth 1 should work with Re;Birth 2, including Hyperresolution Neptunia mod. Has pretty widespread issue, where FPS drops when Guard break is performed in combat. Free DLC is already included with base installation and can be toggled from main menu before starting the game. 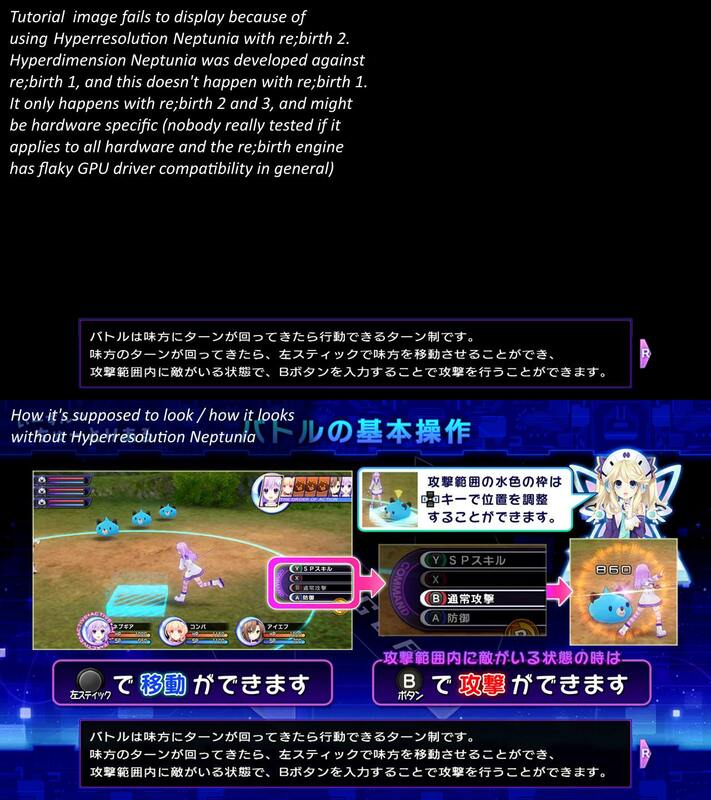 Some DLC (Anime Collaboration Set, Histy's Rescue Plans and Nepgear's Beam Zapper ZERO) are known to break games leveling curve, by giving items that far surpass stats of the normal game items from the very start. 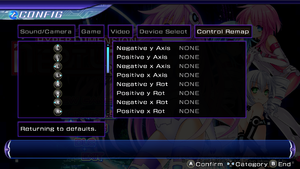 Game's resolution options only go up to 1920x1080. With fullscreen game always uses desktop's resolution despite selected resolution option and resolution overall does not go above roughly 1080p. This may become problematic for low end machines as resolution is only graphical option to get more performance and high end will get blurry visuals. This mod may cause certain objects, such as tutorial images, to fail to render on some hardware. Download archive and extract it into <path-to-game>. 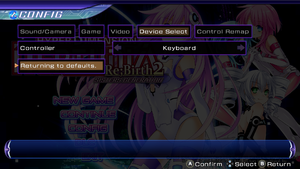 Keys are bind into controller buttons. XInput and DirectInput. With DirectInput rebind the buttons. For DualShock use the Playstation Button Replacer mod. Some cutscenes completely lack voice acting and lipsyncing, including in Japanese. Even though audio sliders are provided, audio mixing is somewhat inconsistent. Most notable example is overworld map music, which much higher constant volume. Lipsyncing is done for japanese audio. Fan translation by «ZoG Forum Team», text + textures or text. This seems to have been the problem since closed beta state and is occurring even on higher end machines. Using Hyperresolution to lower rendering resolution and playing from SSD doesn't fix the issue, but will make the drop last much less. In game parts include entering the "LAN castle" for the first time. For some users, this issue seems to be related to some DLC. Playing without DLC solves the issue. The developers claim this issue has been resolved as of the 18.2.1 AMD driver release. Recent AMD drivers break textures in dungeons on most AMD hardware. 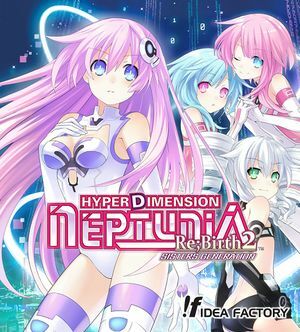 Driver version 17.7.2 is known to work with re;birth 2. Uninstall current graphics drivers if needed. Install Radeon Software Crimson ReLive Edition 17.7.2 or older. 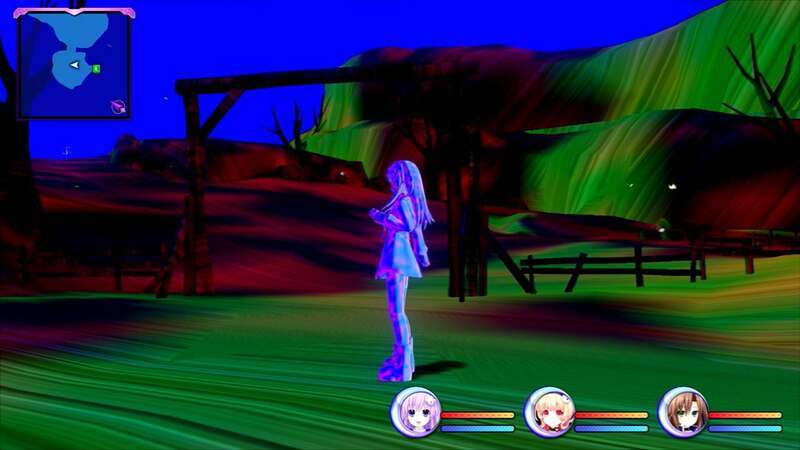 Reboot if rainbow textures persist. Radeon Software Crimson ReLive Edition 17.7.2 is old enough to cause compatibility problems with other games like Overwatch. ATI Mobility Radeon HD 5xxx, 1 GB 5000 series may not work properly with this game. ↑ 2.0 2.1 File/folder structure within this directory reflects the path(s) listed for Windows and/or Steam game data (use Wine regedit to access Windows registry paths). Games with Steam Cloud support may store data in ~/.steam/steam/userdata/<user-id>/351710/ in addition to or instead of this directory. The app ID (351710) may differ in some cases. Treat backslashes as forward slashes. See the glossary page for details. ↑ Timeline photos - Idea Factory International, Inc. - Facebook - "DLC is not 50% off, BUT the free ones are already included in the game so you don't need to download them separately. :)"